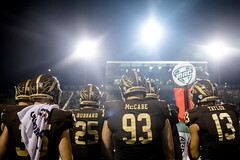 Western Michigan and Syracuse football programs joined forces Friday night for their wild season opener to make the game an Uplifting Athletes Rare Disease Awareness Game. Players from each team wore Uplifting Athletes stickers on their helmets in support of the Rare Disease Community. During the first quarter, rare disease patient Chloe Hunt from Alagille Syndrome Alliance, along with her mother and 14-year-old twin sister, joined the teams on the field and were recognized. Prior to the game Chloe and her family were given a tour of the Western Michigan football facilities and were also able to meet the Syracuse players and coaching staff in the tunnel before warm-ups. The game itself was a tale of two halves, as the Orange raced out to a comfortable 27-point halftime lead before the Broncos put together a furious second-half rally that made Syracuse insert starting quarterback Eric Dungey back into the game. 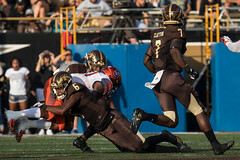 Western Michigan had no answer for Dungey, as the senior rang up 384 total yards of offense and three touchdowns. His 200 rushing yards was a single-game school and ACC record for yards on the ground by a quarterback and earned Dungey the Uplifting Athletes Rare Performance of the Week. Penn State: The Nittany Lions used a little veteran savvy from quarterback Trace McSorley and the playmaking ability of newcomer K.J. Hamler to escape the legitimate upset bid of Appalachian State with an improbable overtime victory. Seven plays after Hamler returned a kickoff 52 yards, McSorley hit the redshirt freshman for a 15-yard touchdown pass inside the final minute to force overtime. Northwestern: Strong first-half performances by running back Jeremy Larkin and quarterback Clayton Thorson allowed the Wildcats to score all 31 of their points in the first half to hold off Purdue on the road. Northwestern winning another close game is no real surprise. Doctors told him it could be a year before he was back on the field. Illinois: Behind the stellar second-half by dual-threat quarterback AJ Bush the Fighting Illini rallied from a 14-point halftime deficit to edge Kent State for its 21st consecutive victory in the home opener. Bush finished with 329 of the Illin’s 469 total yards (190 passing and 139 rushing). Reggie Corbin’s 1-yard plunge with 10:39 to play was the difference. Felt good to get back on the field. Notre Dame: The Fighting Irish landed some big-play haymakers early and built a 21-10 lead then turned it over the Notre Dame defense to slam the door on Michigan in a marquee Week 1 match-up. The ND defense limited Michigan to 307 total yards and forced a pair of key turnovers. Te’von Coney and Khalid Kareem combined for 19 tackles, three tackles for loss and two sacks to pace the Fighting Irish defense. Baylor: Using a balanced attack offensively, 295 rushing and 311 passing, allowed the Bears to race to a comfortable non-conference victory that snapped Baylor’s eight-game losing skid at home. Three of the Bears’ first four touchdowns covered 20 or more yards. Davidson: The Wildcats overcame weather delays with a fast start fueled by RB Wesley Dugger’s 67-yard scamper for a touchdown on the third snap of the game. Davidson rolled up more than 400 yards of offense and scored all 34 of its points in the first half. Maryland: The Terrapins came up huge for the second year in a row in the opener, stunning previously No. 23 ranked Texas. Maryland coughed up an early 24-7 lead and had to rally in the fourth quarter to come from behind. The Terrapins forced three turnovers in the final 6:09 and scored the final 10 points to post an emotionally charged victory. NC State: Junior wide receiver Jakobi Meyers posted a career-high 14 catches for 161 yards to help the Wolfpack hold off FCS power James Madison. NC State was a slick 11-for-16 on third-down conversions and its defense allowed only one touchdown. Colgate: Behind 194 passing yards and two touchdowns from sophomore QB Grant Breneman the Raiders were able to edge Holy Cross to record their eighth consecutive win over the Crusaders. Colgate had to hold off a late rally from Holy Cross, after building a 24-0 halftime lead. Clemson: As expected, the Tigers went to 33-0 against FCS opponents behind strong efforts from both of its quarterbacks in easily dispatching of Furman by 41 points. Lehigh: Running back Dominick Bragalone rushed for 139 yards and three touchdowns and the Mountain Hawks’ Jon Seighman blocked a 30-yard field goal attempt with 33 seconds remaining to hold off fellow Uplifting Athletes Chapter Saint Francis. STAY TUNED NEXT WEEK FOR OUR WEEKLY BEYOND THE TROPHY SERIES!